The 4 Ps of marketing, also known as the producer-oriented model, have been used by marketers around the world for decades. Created by Jerome McCarthy in 1960, the 4 Ps encourages a focus on Product, Price, Promotion and Place. Recently, the growing influence of the Web has made these classic principles look a bit archaic. Since modern buyers can learn almost everything about your business, the 4 Ps of marketing may be at odds with how B2B works today. First, we need to look at the potential problems with the old way of doing things. Then, we need to identify a framework that can cover the same fundamentals, but is aligned with the changing landscape of B2B marketing. Where do the 4 Ps of marketing fall short? According to a five-year study by Ettenson, Conrado, and Knowles involving more than 500 managers and customers in multiple countries, the 4 Ps of marketing undercut B2B marketers in three important ways. It leads marketing and sales teams to focus too much effort on product technology and quality. Even though these factors are important, the researchers stressed that they are not a significant differentiator; they're just the cost of entry. The 4 Ps of marketing under-emphasize the importance of building a convincing case to explain the value of the solution being sold (i.e., not enough time is spent educating customers on why the product is needed). It distracts businesses from leveraging their advantage as a trusted source of problem solving. Today, companies can use information outside of FAQs/tutorials to aid customers and improve customer retention. If the 4 Ps of marketing are no longer agile enough to work for modern businesses, what framework should entrepreneurs and marketers look toward instead? According to Eduaro Conrado, Chief Marketing Officer for Motorola and one of the authors of the study, we should look to the S.A.V.E framework. S.A.V.E focuses on the Solution, Access, Value, and Education of a product or service. 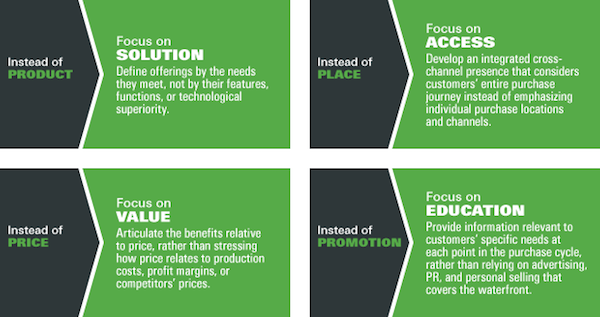 Below we'll discuss the important differences it emphasizes over the 4 Ps of marketing. "Customers don't care about product features or usability if a product fails to solve their problem," says Ruben Gamez, founder of Bidsketch. "It's not about the features you want your product to have, it's about the problems that customers need to solve. Solve their problem better than anyone else and you'll end up with a product your customers can't live without." Too often, businesses get caught up in the features, functions and technological superiority of their product over the competition. The reality is that none of that matters to customers if they can't clearly match the outcomes being promised to the problems they have. If you're building a product or service based on features and not based on customer needs, you're working backwards. Don't let your product developers (or even yourself) get caught up with needless features, integrations and "improvements." If the great new thing is not going to help your customers out in a serious way, it's nothing more than bloat. "In an age where many businesses operate around always-on Internet access, "place" is becoming irrelevant," says Jay Baer, author of Hug Your Haters. "When you can dip into almost the entirety of the world's knowledge from the phone in your pocket, you're always able to research, buy and advocate. It's not about Place any longer. Now, it's about Access. What can a brand give me at this precise moment that I want or need? That's the bar companies now have to clear, and it's not easy." The key here is not to disseminate your home base, but rather to create a cross-channel presence that considers a customer's entire purchase journey, not just where they seal the deal. This idea deals goes far beyond product promotion; for example, Help Scout's presence on Twitter has as much to do with providing great customer service through fast answers as it has to do with promoting our articles and resources. Customers want your business to be accessible. They want to know that your support will have their backs. To achieve this, they need to see you engaging with other customers to get a sense that you'll be there should something go wrong. "We occasionally have customers tell us that our product is too expensive, and they're sure that they can find a similar service on the web for free," says Walter Chen, founder of iDoneThis. "But to us, price isn't just a number, it's a strong connotation of brand and value. When we hear customers say that our product is too expensive, before wondering if we should lower the price we are more concerned with whether we should increase our product's value." Do customers care about your price in relation to your production costs, profit margins and competitor's prices? While customers have concerns about price, that comes after their concerns about value. Clear, compelling communication about the benefits of your product is how you gain pricing power. Research from Stanford University even shows that comparative pricing is often a horrible way to frame your prices, and numerous additional studies on "context pricing" reveal that perception of value is far more important to customers when accepting higher price tags. The old four Ps model doesn't fundamentally encourage this need to build a robust case for showing customers the value your product provides, and it places too much emphasis on the literal, tangible price of the product (or service). "One of the old truths of marketing is the law of 7. Someone needs to see or interact with your brand for 7 times until they eventually sign up or buy what you have to offer," writes Leo Widrich, COO of Buffer. "Over the past 2 years since we started to heavily focus on content marketing for Buffer, I genuinely believe that we have brought that number down. Simply because providing someone with free, and useful information, creates a much stronger bond and connection than any banner ad or press mention ever could." The old methods of marketing were limited to interruption, but the marketer of today has the opportunity to be involved with customers' needs at each point in the evaluation and purchase cycle. In many ways, modern businesses can act as media companies, providing current and potential customers with information and advice that helps them do their job better. This creates a sense of familiarity and trust long before a purchase is even made. At Help Scout, we write about content that our customers want to read, such as providing better support, reducing ticket load and "bad contacts," and creating educational help content. As a form of attraction-based marketing, content gives companies the opportunity to provide value and create a long-term, compounding marketing asset that pay-to-play advertising can't mimic. Businesses that continue to embrace the outdated 4 Ps of marketing model are run the risk of involving themselves in a repetitive and increasingly unproductive technological arms race. The customer of today has far more say in the business-customer relationship, and embracing a framework that reflects their real concerns can help marketers provide and create more value for the people who purchase their product.